Greetings Gamers! Here we are… the Big Game is taking place on Sunday and then we can focus on some Way Too Early NFL BestBall Drafts! Fantasy football does not have to have an offseason. Enjoy a special 50% discount on your first month of any Awesemo Premium monthly subscription with promo code PRIMETIME. Join now and gain access to all of the projections, rankings, and expected ownership percentages you need to get ahead of The Masses in DFS NBA, NHL, PGA and more. This LIMITED OFFER INCLUDES the FantasyCruncher Add-on as part of the promotion. Quarterback – Jared Goff will have his work cut out for him as New England head coach Bill Belichick has had two weeks to plan against the plans that Rams head coach Sean McVay is implementing for the Super Bowl. On the season the Patriots posted the #21 rushing DVOA and the #19 passing DVOA, but once again they seem to be improving every game down the stretch and into the post season. They did allow a combined 626 passing yards and six touchdowns to Philip Rivers and Patrick Mahomes, but the former got there in garbage time and the latter is arguably this year’s MVP. In his pair of playoff victories, Goff passed for 483 yards, but only one lonely touchdown. He will have his work cut out for him, but will likely be heavily involved in the fantasy production if the Rams are going to trade haymakers with New England in the championship game, indoors with the highly projected point total. Running Back – Todd Gurley II has been an enigma since Week 13 and his fantasy production has relied heavily on touchdowns as he has been outproduced by late season waiver wire claim C.J. Anderson. Allegedly Gurley is healthy, and he has been practicing in full for most of the last three weeks… but each of us is going to have to make our own decision on his health, involvement and potential production. In Week 15 on Sunday Night Football in a loss to the Philadelphia Eagles, it was clear that Gurley was not at full strength, though he did manage two rushing touchdowns (12/48/2) and saw 13 targets for 10/76/0… he then missed Weeks 16 and 17, along with some coach-speak about his status from Sean McVay. He was solid in the Divisional Round against the Dallas Cowboys with 16/115/1 and two targets for 2/3/0, but he was outproduced by C.J. Anderson who toted the rock 23 times for 123 yards and a pair of touchdowns. Next week during the Conference Championship, Gurley had a couple early drops and was replaced/outplayed once again by C.J. Anderson 16/44/0 and one target for 1/5/0 to Gurley’s 4/10/1 and three targets for 1/3/0. Let us not forget that Todd Gurley has arguably been a top two running back the last couple of seasons and the last month seems more like an aberration than a new reality for the player that led the league in touchdowns this year playing in just 14 games and who was second with 89.4 rushing yards per outing. C.J. Anderson is in his sixth season after being acquired as a rookie undrafted free agent of the Denver Broncos the year they lost Super Bowl 48 to the Seattle Seahawks 43-8, with Anderson getting two carries at the end of the game sharing the backfield with Montee Ball and Knowshon Moreno. Two years later he led the Broncos with 90 yards rushing and a touchdown in Super Bowl 50 as a resergent Orange Crush Defense and Peyton Manning dispatched the Carolina Panthers 24-10. A lot of DFS gamers have written him off, but how quickly they have forgotten that he had his only 1,000 rushing campaign last season playing in all 16 games for the Broncos with 245/1,007/3 and converting 40 targets into 28/128/1 to boot. In his four games so far with the Rams he has led the team in rushing each time out topping 120+ yards three times and scoring four total touchdowns. While it is not likely that he will be active in the passing game, he should at the very least spell Todd Gurley throughout the game and there is a chance we see Los Angeles ride whichever back gets off to a good start. When Cooper Kupp was lost for the season in Week 10 Jared Goff focused most of his attention on his dynamic duo of receivers in Robert Woods who was the leading pass-catcher for Los Angeles with 131 targets for 86/1,219/6 and added 19 carries for 157 yards and another score and Brandin Cooks was right there with 116 targets for 80/1,204/5 and also had 10 carries for 68 yards and a score. The Rams spend a fair amount of time in three-wide receiver sets and that means that Josh Reynolds should be on the field for most of the snaps. As we can see, there is not much left over for Reynolds and the tight ends to share, but they are all viable options in the large field Big Game contests as differentiation plays in the hopes that we land on the one that lucks into a touchdown. Tight Ends – Tyler Higbee has been on the field for 15 more snaps in the playoffs and he is the better blocker with a more polished college pedigree and size at 6’6″ 255 lbs with Gerald Everett at 6’4′ 240 lbs and the unfortunate accolade of the smallest hand size at the 2016 Senior Bowl (tied with RB Donnel Pumphrey who is 5’8″ – isn’t Wikipedia just full of fun facts!). During the regular season it was Higbee that lead the way about 2-to-1 in snaps, but after the Cooper Kupp injury the workload was much closer as the Rams did show more two-TE sets. Everett finished the regular season with 51 targets for 33/320/3 and Higbee was at 33 targets for 24/292/2 so it seems to be a function of who is on the field at the right time for any opportunities going to the tight end (aka coin flip time). Defense/Special Teams – New England allowed just 21 sacks this season which was the third fewest in the league and their 18 combined turnovers was seventh best. We are hoping for a lucky big play for this unit to pay off. Quarterback – 2001, 2003, 2004, 2007, 2011, 2014, 2016, 2017 and now 2018… these are the NFL seasons when Tom Brady and the Patriots have appeared in the Super Bowl during his career… yes, this will be the ninth time he is playing in the Big Game which is just jaw-dropping to think about. The Rams have been solid on defense with the #6 passing DVOA, but they have shown cracks with the #24 rushing DVOA per Football Outsiders and during the regular season Los Angeles allowed 5.1 yards per carry, the highest in the league. I bring that up in the quarterback section, because I believe it will help keep some of the pressure off Brady if defensive linemen Ndamukong Suh and Aaron Donald must wait a beat and respect the run, before going after Brady. It will be great to see how master tactician Bill Belichick approaches this potential opportunity for Sony Michel. Back to Tom Terrific, we know that he will be leaning on WR Julian Edelman, RB James White with shots to TE Rob Gronkowski across the middle and likely a couple shots to WR Phillip Dorsett and Chris Hogan on double move routes. 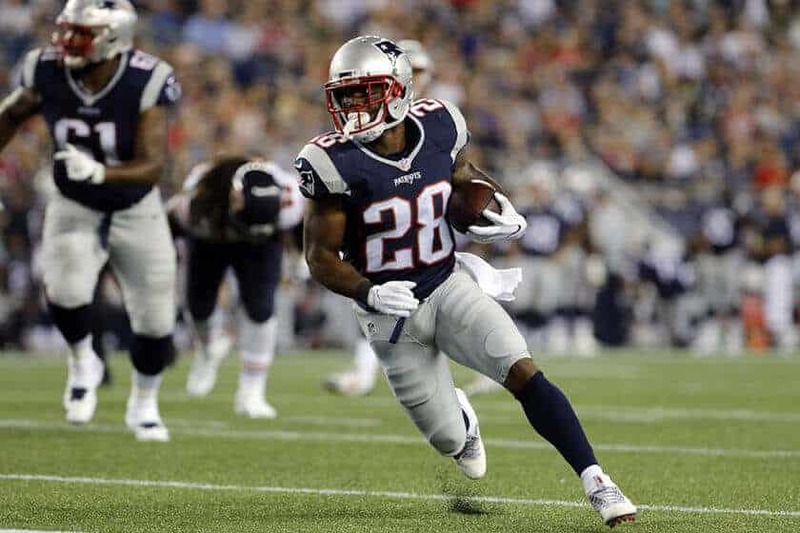 Surprisingly, James White who finished the season with 94/425/5 on the ground and turned 123 targets into 87/751/7 through the air did not have a touchdown. The 15 receptions White had against the Chargers tied Darren Sproles for the all-time single game playoff record for receptions by any pass-catcher and the 14 that he had in Super Bowl 51 is the second highest figure. Speaking of the Big Game matchup against the Atlanta Falcons, we need to recall that White was phenomenal with 6/29/2 on the ground and converting his 16 targets into 14/110/1 as a receiver. He is still my favorite priority, followed by Michel and then Burkhead. Wide Receiver – it is no surprise that Julian Edelman has been far and away the main wide receiver that Tom Brady has focused on in clutch situations, as this is the ninth season they have played together. Through the first two playoff games, Edelman has tallied 23 targets for 16/247/0 and while he has not scored, he is the key to the Patriots passing attack. While the volume has not been there as high for Phillip Dorsett he has been solid with 8 targets 5/70/2 and has stretched his streak to three straight games with a touchdown. In the first two playoff games Chris Hogan has seen 12 targets for 12/58/0 and we know after last season and heading into this year it looked like he would be “The Guy” for Brady while Edelman was serving his four-game suspension. While that did not come to pass, he is still a viable option as a differentiation play in the hope he manages to find the end zone for just the fourth time this season. Tight End – just when we thought the nine-year veteran was going to be relegated to blocking duty and only see looks in the red zone, he was let loose getting a season high 11 targets on his way to 6/79/0 and while he did not have a “Gronk-Smash” performance by any stretch, it was good to see he potentially could still “get there” in the right situation. Defense/Special Teams – reaching back to Week 15, the Rams have ceded just four sacks, two fumbles and three interceptions over their last five games. We need a return touchdown for the Patriots D/ST to be a viable option. Strategy – the contests are massive this week and most of them are also extremely top heavy. On DraftKings if you want to make a “safer” lineup for “cash games” (aka head-to-heads, 3-mans, double-ups, triple-ups, etc.) in the hopes that your opponents make mistakes, you can readily fit in both quarterbacks along with one of their favorite receiving options with just a little creativity. On FanDuel, it is still possible, but you will likely be sacrificing a lot with your last player, so you are probably better off with both quarterbacks, one top receiver and then two mid-tier options who should have potential opportunities heading their way. For the large field tournaments, literally anything goes if you are hoping to score a first place finish and only be tied with a handful of entries at the most. Remember that this is entertainment and DEFINITELY stay within your means. As always, you can reach out to me in Awesemo.com Premium Slack or on Twitter @EMacDFS if you have any questions.